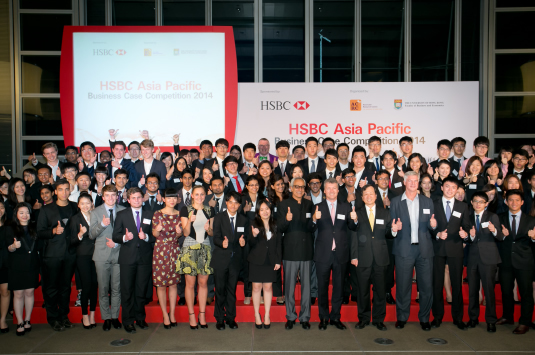 9 universities from Hong Kong competed in the HSBC Hong Kong Business Case Competition 2014. The three equal winning teams of the HSBC Hong Kong Business Case Competition 2014 were City University of Hong Kong, Lingnan University and The University of Hong Kong. The three winning teams represented Hong Kong and competed at the HSBC Asia Pacific Business Case Competition 2014 on June 5-6. Each winning team in the Hong Kong competition was awarded with HKD8,000. 24 universities from 16 Asia Pacific countries/territories sent their top teams to Hong Kong to compete in the HSBC Asia Pacific Business Case Competition 2014. The competition was organized by the Asia Case Research Centre of The University of Hong Kong. This was the 7th year that HSBC has supported this event. After 4 rounds of competition on June 5-6 2014, the championship went to The University of Hong Kong, followed by first runner-up the University of Auckland and second runner-up National University of Singapore. They were awarded with USD10,000, USD5,000 and USD2,000 respectively.